William Bedwell – The Father of Arabic Studies – Muslim Museum UK – Uncover the 1400 year relationship between Britain and Islam. Explore the history and heritage of Muslims in Britain. William Bedwell (1561–1632) was an English priest, scholar, orientalist and Arabist. He specialised in Semitic languages, with a passion for Arabic and a keen interest in mathematics. He was also Vicar of Tottenham High Cross, London. He is often known as the father of Arabic studies in England (and Europe). Bedwell was educated at St. John’s College, Cambridge where he refined his studies in Hebrew, Aramaic, Syriac, and later, in Arabic. 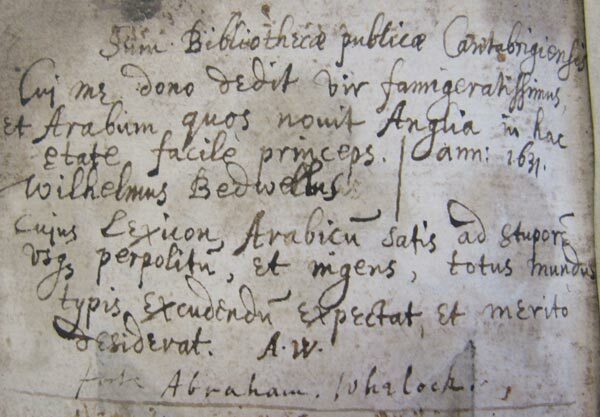 Bedwell started an ambitious project to produce an Arabic dictionary, first conceived by his friend and mentor, Lancelot Andrewes. 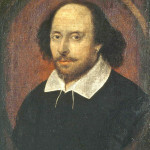 By 1585 he had produced some 800 pages, and by 1599, he had added another 600 pages. The Cambridge University Library did not have any Arabic work in its collections before Bedwell donated his own copy of the Qur’an upon his death. On the first leaf of the manuscript can be seen the dedication by Abraham Whelocke (1593–1653), the first Professor of Arabic in Cambridge and also the University Librarian. He left many Arabic manuscripts to the University of Cambridge, with numerous notes upon them, and font types for printing them. Some of his work (Persian dictionary) can be found preserved in the Bodleian Library at Oxford. Bedwell was called upon to act as a translator of official documents and as an interpreter. 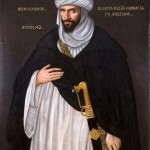 When the Moroccan Ambassador Abd el-Ouahed ben Messaoud arrived in England to visit Queen Elizabeth I, 1600, it was Bedwell who met him first. He produced an Arabic translation of Epistles of St John, however, his most well-known published work was ‘A Discovery of the Impostures of Mahomet and of the Koran’ in 1615. He was among the “First Westminster Company” charged by James I of England to produce the ‘King James Version of the Bible’.